Helmet Hand Fans Design Helmet Hand Fans20 MM wide polyester lanyard allows a wide space for your logo to be printed, These lanyards are idea for your large complex logo. It comes with free metal Bulldog clip with Badge Holder attached. 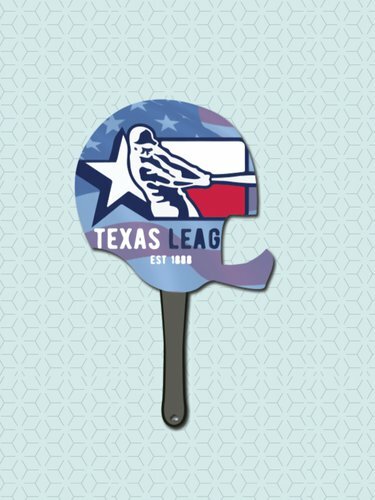 You can select the Helmet Hand Fans from our stock hand fan shapes available in varied sizes and can customize them with your own design and messages for business or promotional purposes. They are manufactured with the highest quality premium thick 16 point card stock board and contain the wooden handle attached with adhesive to the back of the fans. These fans have both sides printing options available which are done through our high quality offset digital printing that creates the perfect appeal for your business and event promotions. Our hand fans do not have any extra setup charge which makes them more reasonable.